It’s been happening ever since we heard about Adam and Eve. Eve blamed the serpent for eating the fruit she was forbidden to eat, Adam blamed Eve and the serpent and so it begins. But, did you notice what happened to Eve? How about Adam? Did Adam get away with what Eve “made” him do? Did he suffer a less consequence because Eve ate the forbidden fruit first, or did he suffer the consequence of his own actions? If you answered that he suffered the consequence of his own actions, then, ding, ding, ding….you win. 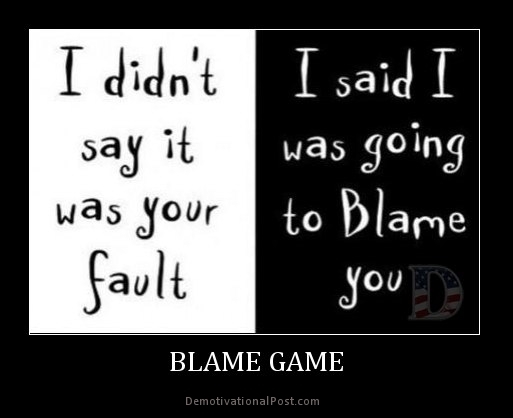 No one wins in the blame game. When I stand in front of my Father, will whoever I chose to blame for my actions be standing with me on judgment day? I think not. But, how funny would that be to glance over and see my accomplice or scapegoat and point and proclaim…”it was all their fault.” Do I really think I could stand in front of Him, He without sin and say… “that sin of adultery was soooo not my fault. No, no, no, I was drunk and soooo…..yea….the alcohol brought down my inhibitions and well, I wasn’t in my right frame of mind. And, hellooo, let me just add I didn’t commit adultery by myself….after all, I had a partner. You saw that, right? They took advantage of ME.” Insert Cheshire cat like grin here because I was just ever so clever justifying my sin away. Better not get too comfortable patting myself on the back because I’m pretty sure the blame game might “work” here on earth, but I’m for certain it ain’t a gonna fly with the One who very specifically said…”Thou shalt not.” There’s a whole list of those pesky “Thou shalt nots.” They’re very specific and geared for our safety and well being. When was the last time you took a good look at His Commandments? Break one, break them all. Sin is sin, no matter how big or how small. You can’t ignore it, you can’t justify it, and you can’t blame anyone or anything else. You have to be able to stand on your own merit and claim it. Otherwise, how do you repent? How do get the forgiveness He wants to give you? How do you live the life He wants for you? Oh, that’s right, you don’t!! 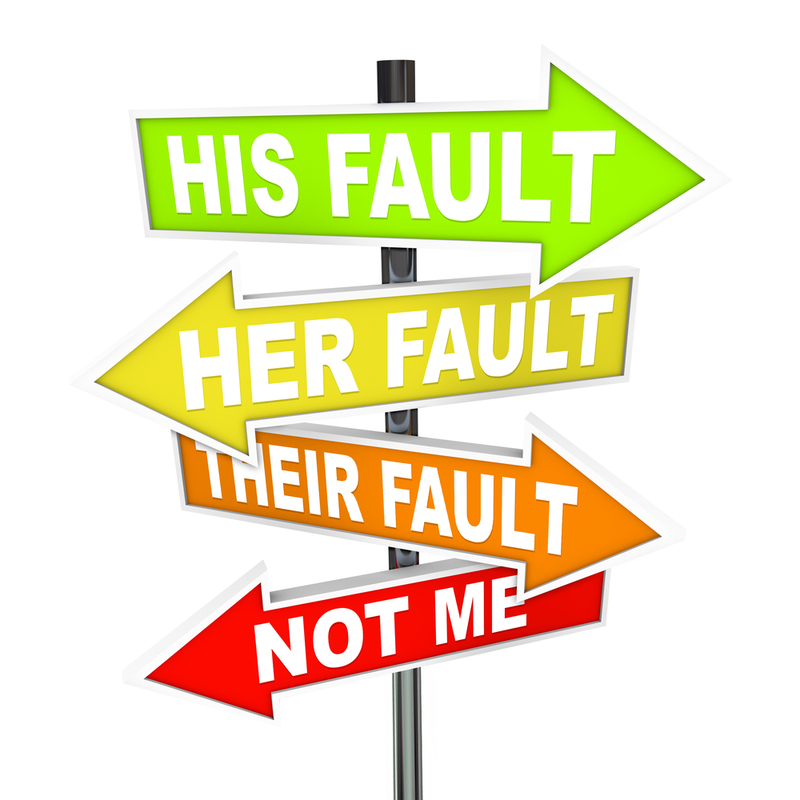 What sin are you holding onto by blaming someone or something else? As you read that, did something “pop” into your head? It’s there because you can’t wish or will it away. It will always come back until you lay your claim to it, repent and seek forgiveness from the Only One who can wash away that which takes up negative space in your being. I say being, because sin doesn’t just affect your head. It affects your health, and it affects the person you can’t be because you’re too worried that someone may find out your “dirty little secret.” How exhausting is that?!! Trying to constantly hide behind your sin is no way to live. Oh, the enemy loves for you to live your life this way. In fact, he hopes you get totally reconciled with your sin so that you can do the next bad thing that will put you even more under his control. I don’t know about you, but I never want to be OK with my sin. I want it gone. Confession is good for the “soul.” If it’s good for the soul, it’s totally good for you and those around you!! May not be easy to stand on your sin, but it’s gonna be way easier than carrying it with you where ever you go. Time to get out from under that mess and get your life back on track. Let go, and let God!! Well stated my friend. There is no time to me hanging on to sins. Let them go and be free. It’s often better to get anything free of charge.